The industry does not seem to have much difficulty getting a new toxic substance approved. Companies have been trying for years and suddenly, as if by magic, isoglucose, called corn syrup, has been approved by the EU! Thus, unbeknownst to the public, the sugar market and the sweetener industry has obtained new regulations. Isoglucose has been officially approved as a food additive since October 2017 . In the end, it is an artificially produced sugar, even though corn is a component of it. The European food industry is trying not to bring this information to the public so that companies are not as badly treated as their competitors in the United States. In this country, customers are increasingly buying their soft drinks in Mexico, because cane sugar, much more expensive than isoglucose, is still used there. This is probably why everything was adopted discreetly and secretly in Brussels. All restrictions on this artificial sugar have been lifted by the EU! In the future, this substance will be used in ice cream, chocolate, bread, baked goods … and and and. Recent studies show that isoglucose is particularly harmful to health. The European Commission plans to triple isoglucose production in Europe from 0.7 million tonnes to 2.3 million tonnes. In the EU, isoglucose, which is mainly produced from maize, has played only a minor role so far, unlike countries such as the United States and Canada. In 2017, US producers will be able to supply the European market with artificial sugar, produced mainly from corn starch and containing a lot of dangerous fructose. This is likely to lead to type 2 diabetes, especially in young people. Since 2000, isoglucose consumption in the United States has been declining rapidly for health reasons. For this reason, many factories had to close. With this new boom in Europe, isoglucose (made from Monsanto’s US products) is now imported to meet demand. We can wonder if we can avoid it in the long run, because it is used everywhere! I have looked at some products and it is already present in most of them. In the past, “sugar” was written on the content. Now it’s isoglucose that is referred to as glucose-fructose syrup or fructose-glucose syrup! Most soft drink manufacturers use a lot of corn syrup containing fructose to sweeten their drink, which is produced from GMO cereals, processed industrially and mixed with chemicals to become a sweet syrup. For example, a bottle of Coca-Cola contains 65 grams of isoglucose (fructose-glucose syrup). The EU plans to use 2 million tonnes per year by 2023. This means that 2 million tonnes of less cane sugar will be imported from African countries, which will lead to a new wave of poverty and refugees. 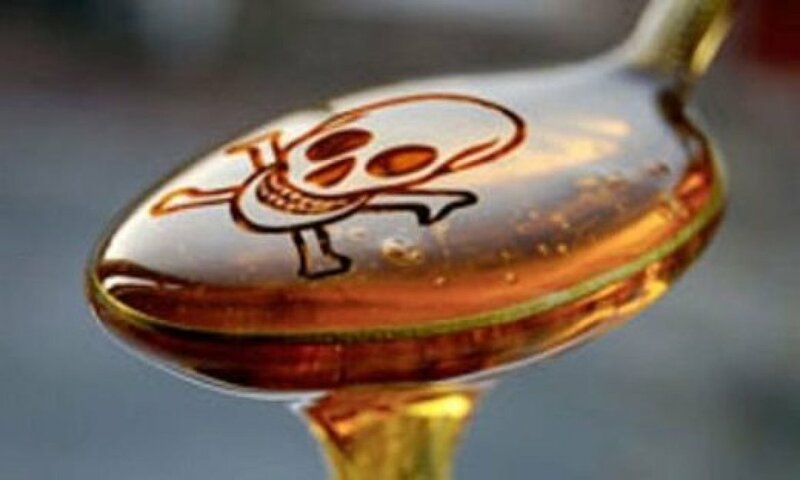 Artificially produced fructose has more negative effects on health than household sugar. These are the results of a new study published in Journal of Nutrition . The increase in obesity in the United States since the 1970s has been accompanied by a general increase in sugar consumption and a shift from granulated sugar to high fructose corn syrup. An animal experimentwith mice also showed the harmful effects: 40 mice were divided into 2 groups. Some received 25% of their daily caloric requirements for crystallized sugar and others for fructose. The mortality rate in the fructose group was twice as high and their offspring decreased by 26%. Fructose consumption in the United States increased by more than 1,000% between 1970 and 1990. Study attributes insulin resistance, type 2 diabetes, obesity and cardiovascular disease to high sugar consumption added in the diet. All this and more is also a small glimpse of TTIP when it arrives. Secret negotiations are already under way. Have a good meal !